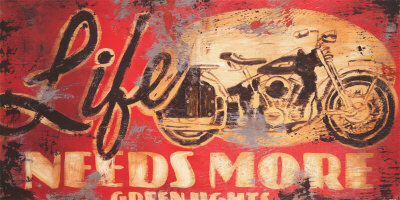 Description: Description: Rodney White gives his painting “Life Needs More Green Lights,” the richly weathered look of an old advertisement with a wry slogan for the person who likes the open road. An Atlanta-based artist, White uses the influence and appearance of an advertisement to promote positive messages instead of products. Believing that the past contains valuable lessons, he replicates surfaces and objects that have an “aged, experienced look” which he gets from flea markets, antique shops, old buildings, packages and time-worn paper. Looks very nice in my bathroom but took to weeks to arrive so only giving it 3 stars.